Palm Sunday has always been a favorite service, especially for children. It celebrates the story of Jesus unexpectedly entering Jerusalem on a donkey. His followers hurried to line the streets and waived branches and laid coats before him. Traditionally, palms have represented triumph and victory and have become associated with this Sunday. Many churches use processions into or around the church to recreate Jesus’ path through Jerusalem. I had the opportunity of experiencing Palm Sunday where it all began. 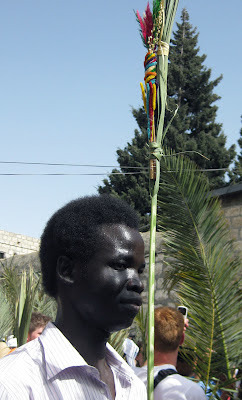 Our Palm Sunday actually started in Bethlehem, at the Church of the Holy Nativity. Occasionally, the church calendar for the Orthodox and the Latin churches are aligned, meaning Palm Sunday and Easter are on the same days. 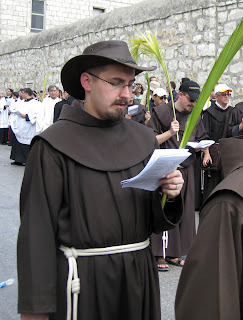 This caused services to be staggered that day so all could enjoy their palm processions. As we awaited the start of the Greek Orthodox service, I watched the young altar boys dressed in purple jab at each other as kids will do universally. But soon the chanting began and the long procession slowly circled the church led by the priests, incense burners, acolytes, banners, choir, and then church members, all carrying palms or olive tree branches. That service would be followed by the Armenian rites. A separate space serves the Latin church as the Roman Catholics are called in Israel. 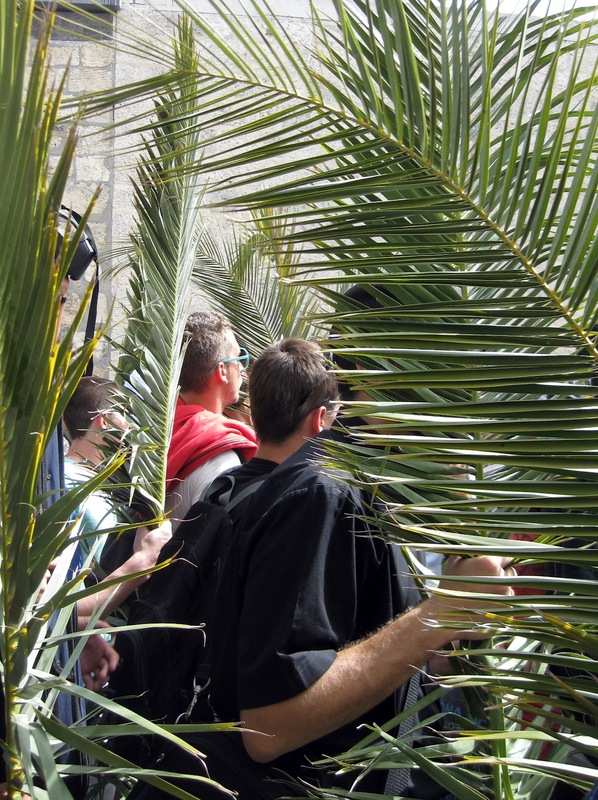 Later that day, we crossed back through the Security Wall and saw many Bethlehem residents hurrying to participate in the Palm Sunday processions in Jerusalem. Because of the crowds, our cab driver could only drop us off several blocks from the start of the Latin parade on the Mount of Olives. The atmosphere was surprisingly jovial and international. While we waited, local children peddled palms and olive branches. Spontaneous songs broke out from the diverse groups around us. I grabbed one of my sisters-in-law and we started walking up the street. “Where are you from?”, we asked many. Poland. The Philippines. France. Korea. Jerusalem. The Maldives. Russia. Spain. There were American Mormon teenagers from Nevada, Girl Scouts, Boy Scouts, and a tour group with identifying green kerchiefs. Gimme hats indicated other tours - “G&S Travel” or “Shepherd’s Since 1965". 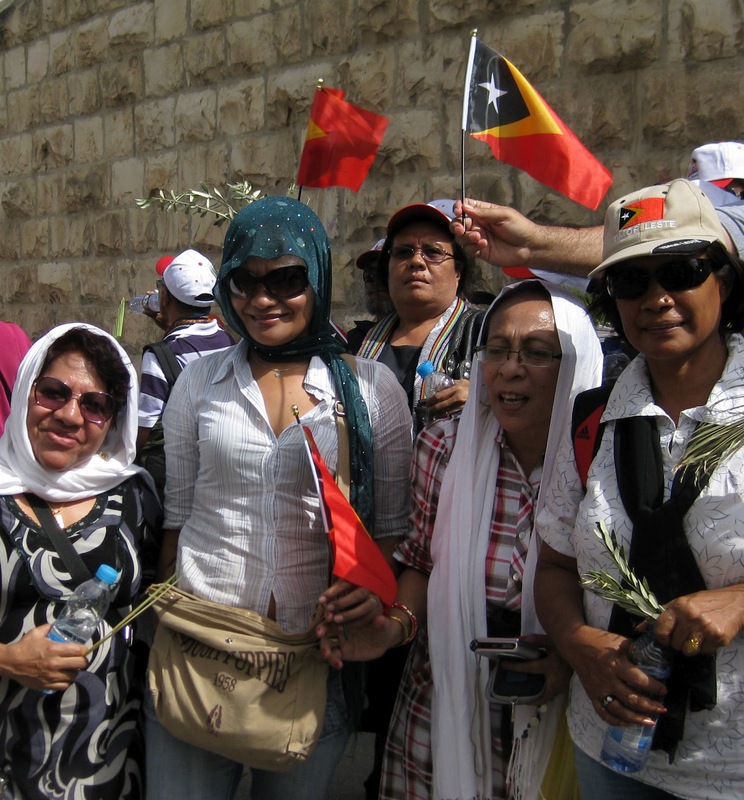 A large contingency hailed from Timor Leste - a sliver of a country near Indonesia that is 96% Catholic and which has only recently begun recovery from years of wars. All smiled broadly as we snapped their pictures. The procession began quietly with a few Israeli soldiers leading the way. But it soon reflected the diversity within the greater world of Christianity. Six foot palms marked the beat with the drums in a large group from Africa. Praise songs and dirges were piped out of speakers held by pilgrims. 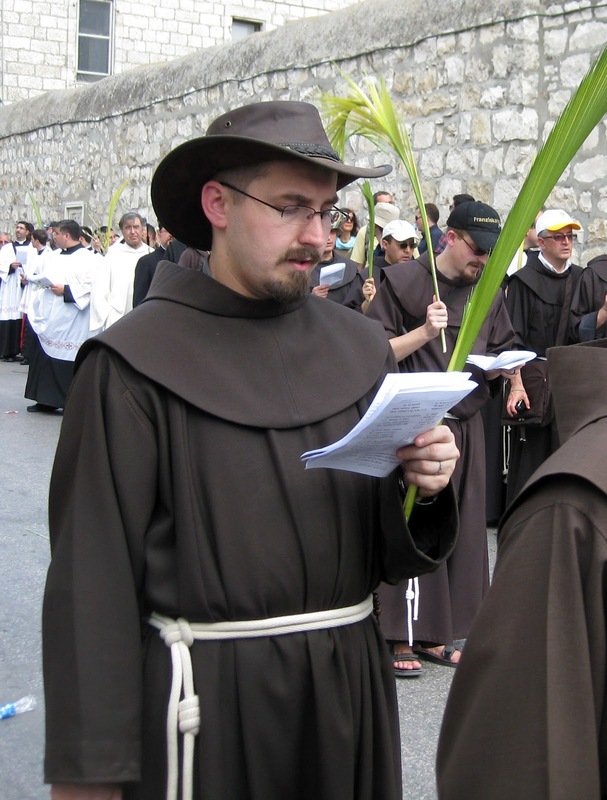 Franciscan monks, with Crocodile Dundee hats, carried songbooks and were accompanied by tambourines and guitars. An elderly woman wearing a hat displaying her mother’s picture was pushed in her wheel chair. There were priests by the dozens and nuns of all colors. At times, it felt like a small town parade. In the past, a person playing Jesus would ride a donkey at the end. But, today, the Latin Patriarch of Jerusalem, Foud Twal, brought up the rear. 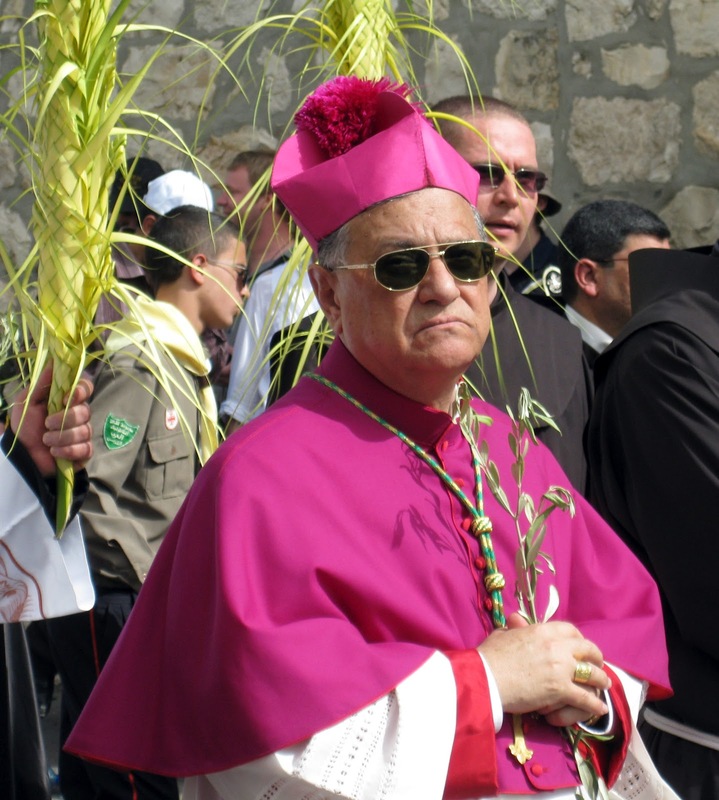 In his resplendent pink robes and gold-rimmed sunglasses, Twal, also the Archbishop of Jordan, carried only a small olive branch. Those on the sidelines could join the procession at any time as it descended from the Mount of Olives, entered through Jerusalem’s Lions gate, and terminated at the Church of Sainte Anne. Israeli soldiers provided a rear guard. The Catholic procession was not the only one that day. The Greek Orthodox and Coptic Orthodox schedule services in the Church of the Holy Sepulchre as do the Armenian and Syrian Orthodox. From 1 to 6 a.m. on Palm Sunday, Ethiopian Orthodox members play drums, cymbals and tambourines and celebrate Mass. 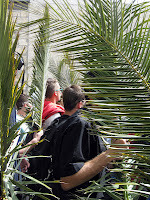 We also saw the last of a procession outside Old Jerusalem’s wall that was just ending at 5 p.m.
Palm Sunday signals the beginning of Holy Week for millions of Christians. The next few days are always more somber and reflective. But on that beautiful Sunday afternoon in Jerusalem, the mood was light, the music varied, and the atmosphere inclusive. For that moment, the divisions in Christianity seemed healed. Clint Frakes’ web site promotes his longevity as a tour guide in Sedona, Arizona. “Guiding pilgrims on Turtle Island sacred sites since 1993” is an offer to explore some important North American locations. Seekers come to him for spiritual guidance, others for Native American history in the area, and all for his breadth of knowledge. This gentle man sees life as a published poet would - in observations of the general world made succinct - and with eyes trained by Native Americans. Clint grew up in Detroit, Michigan. 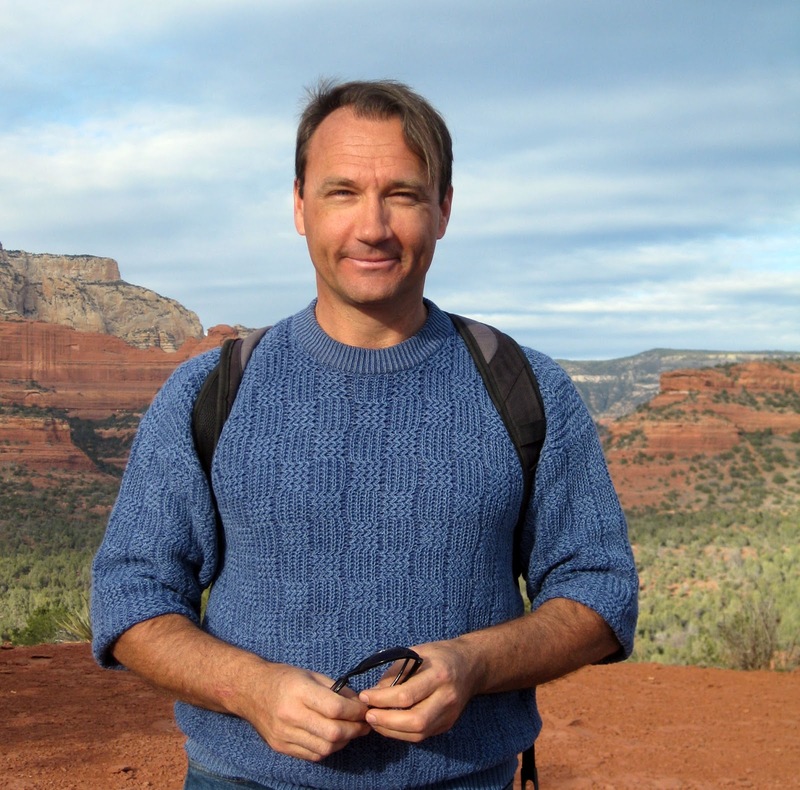 But after attending Naropa University in Boulder, Colorado, Clint was adopted in adulthood by a Lakota (Sioux) family who provided him a “simple spiritual way to guide his life.” He became a man of prayer and uses Native American practices daily. On his tour, Clint was able to connect us to the centuries old respect local tribes have for the natural world. 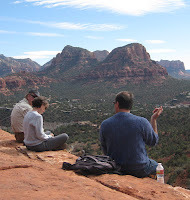 At our first stop on Airport Mesa, we meditated on the red rock, considered a wisdom keeper. Clint quietly educated us. All things that have transpired from the beginning to now are downloaded into stones - the same silicon used in Silicon Valley. We only needed to increase our capacity to receive this wisdom of the past. As we walked the paths in the area, Clint revealed the healing properties of indigenous plants - long known by Native Americans. The plant, Mormon Tea, is good for colds and sinus headaches. 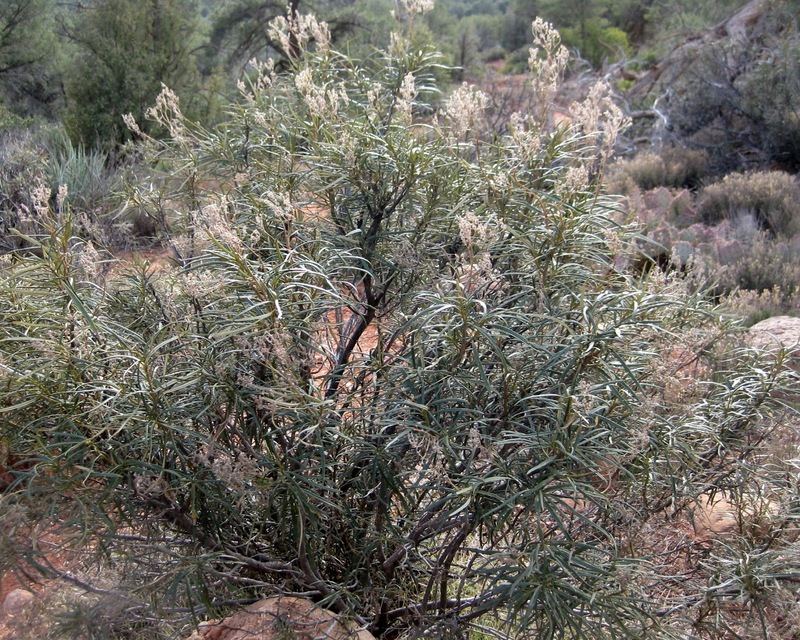 Manzanita helps bladder infections. Use the Banana Yucca for joint inflamation and prickly pear for scorpion bites. Red Root dissolves cysts. But the most powerful is Yerba Santa, used as a lung expectorant and also a treatment for depression. Since my asthma had acted up in the dust, I wanted to try this one. Clint advised me to ask permission of the plant to take some leaves and to make an offering. We poured water on the plant, broke off leaves, and thanked it for its generosity - a surprisingly satisfying gesture. Boynton Canyon, the Garden of Eden of the Yavapai-Apache people, was our next stop. Their legend describes man as emerging from this canyon. But first was Kamalpukwia, the “Old Lady White Stone” who was impregnated by the sun. The nearby “ Kachina Rock” formation resembles this pregnant woman who later gives birth - by one account to twin boys and by another to a girl - from which all tribes came. Today, there are many coming home ceremonies in the Sedona area by various Native American tribes - of the same kind of desire to return to Jerusalem by the Jewish tribes. Our last experience with Clint involved a Lakota Medicine Wheel he had constructed on a well-hidden lot. This formation is the “underpinning of all ceremonies”, a template for the story of creation. Each of the 405 stones in the circle represents one earth medicine. Vertical and horizontal lines of stones cross within and a second circle in the middle signifies the Eye of God or one who unites. The inner formation resembles a Jerusalem cross. Any spiritual belief can be incorporated into the Medicine Wheel experience. The four quarters can represent the four seasons, directions or Gospels. The first instruction was to take a concern or prayer. We then stepped into the circle from the east, where life begins, and stated “all my relations” to honor all things as our brothers and sisters. As we circled three (usually four) times, our prayers were energized by the physical movement and Clint’s singing. After each of us chose a site to sit inside the circle, Clint explained the meanings of our selections. My quarter was associated with guardian angels, an image I liked a lot. We exited the circle next to where we began and gave each other a traditional embrace. The Lakotas believe the web of the wheel holds the earth together and man is essential to the balance of earth. We’re part of the eco-system that must support the natural world around us as that world sustains us. Our brief encounter with the way Lakotas acknowledge this web helped us appreciate the strong connection between nature and Native Americans - a link that our country’s environmental consciousness is finally recognizing as essential to the survival of man. And as a man with a foot in both worlds, Clint Frakes was the perfect guide to bring the two together. Will The Real Sedona, Arizona Please Stand Up? 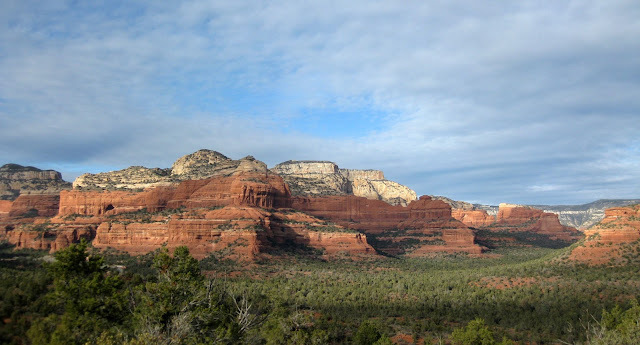 Tourists visit Sedona, Arizona for as many reasons as there are strata in the surrounding canyon walls - made beautiful by the collision of the Sonoran Desert with the Colorado Plateau. 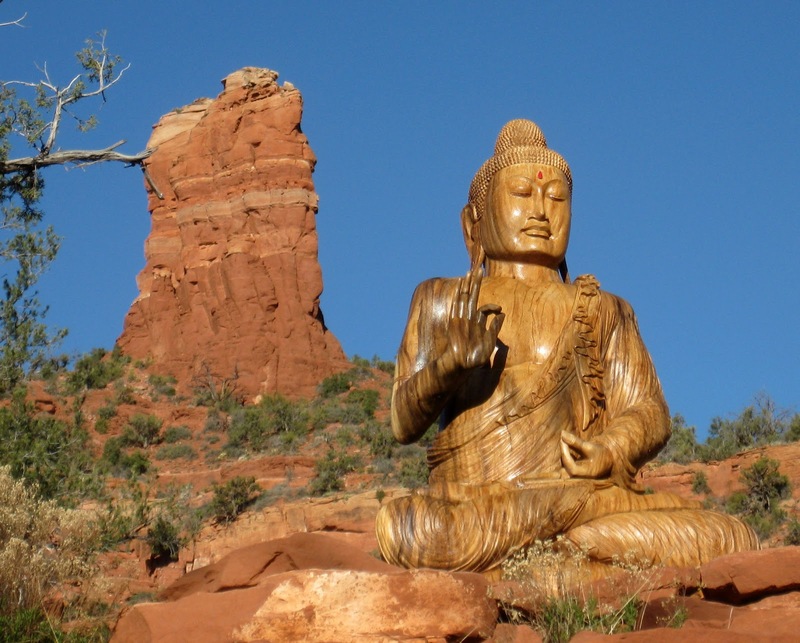 Until recently, Sedona’s history was not that different from other desert towns. Native Americans respected the area as a site for sacred ceremonies and it played a key role in the story of the beginning of man through the Kachina woman in Yavapai/Apache lore. Coronado and his conquistadores mapped the area in the 1500's. Pioneer farmers planted orchards near the waters and ranchers spread out their cattle and sheep. It was quietly discovered by retirees and some artists in the 1950's and 60's including Max Ernst. But in 1978, the attitude and crowd changed. Paige Bryant is a well known psychic who lived in Sedona in the late 70's and 80's. She felt strong energy sources emanating from below and above the earth - cosmic portals. Her description of four vortexes of electromagnetic energy began to draw spiritual tourists. By 1987, Sedona was one of the hosts for the Harmonic Convergence, the world's first globally synchronized meditation or human intention for the good of the planet. Soon the Chamber of Commerce, hotels, and restaurants saw the potential in a united presentation of the energy sources in Sedona. On their maps, small tornado vortex forms hover over Bryant’s sites of Boynton Canyon, Cathedral Rock, Airport Mesa, and Bell Rock. Crystal shops and yoga tours followed. The phone books now lists 11 local psychics who can help your sensitivities. By the 1990's, the attraction of Sedona’s beauty could no longer be contained. Larger resort companies such as Hyatt began buying out ranching families and turning the desert into sun retreats with golf and other amenities. Time shares proliferated. More retirees came as did movie stars. And, of course, the service population grew with the tourist industry although most of those employees must commute from nearby towns with a lower cost of housing. The average cost of a home in Sedona is $394,000. Businesses along the main drag reflect the hodge-podge offerings for the two million tourists visiting this town of 12,000 inhabitants each year. Jeep Rentals compete with Crystal Magic for customers. Hot Yoga and Canyon Outfitters appeal to different crowds. Cashing in on a more recent industry, the Sedona Wedding Studio vies for the destination couples. The religious world is just as mixed. 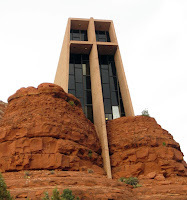 A variety of Baptist churches, a single Cowboy Church and the usual list of mainline Protestant denominations compete with Mormons, the area’s largest group. The stunning Holy Cross Catholic chapel, designed by a student of Frank Lloyd Wright, peaks out between two large red rock towers, rumored to also be a vortex site. And the laid back crowd is treated to a rare, western Buddhist Stupa, considered to be the living presence of the Budha and to have healing powers. 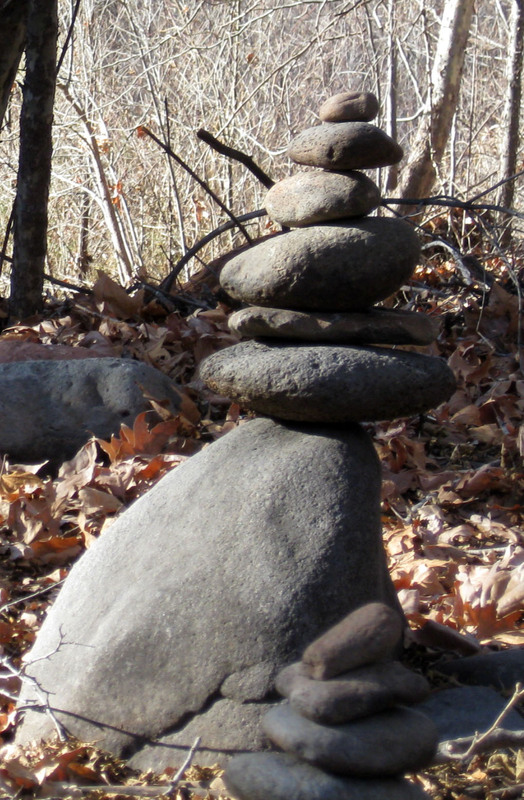 Its affect is reflected in the many Buddhist rock cairns built on and added to the trails of the area. The result of this cauldron of interests is something for everyone. Hikers happily choose from a maze of trails in and out of the red canyons. Meditators easily find a quiet spot to inhale earth’s energy. More sedentary adventurers ride in pink jeeps that haul them up to mesa tops for a full 360 degree view of the geological wonder. In the mornings, hot air balloons linger above. Golfers soak in the clear air and temperate climate for months of playing time. And, everyone seems to pull off the roads in the late afternoon to take in one more glorious sunset. Sedona’s Community Plan acknowledges the challenge of maintaining local character and quality of life while ensuring a quality experience for the visitors. The balance is delicate, especially at high season. But Sedona’s been dealt an amazing hand of light, air, and beauty that will continue to draw crowds. 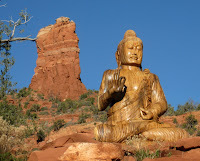 And whether it’s spiritual solace or spa soaks, Sedona will deliver - as it always has.